Whitmer’s plan would make Michigan’s one of the highest fuel tax rates in the country, behind the likes of California and Pennsylvania. Michigan motorists currently pay 26.3 cents per gallon. Total at-pump costs in the state are already the sixth-highest in the nation, in part because Michigan applies its 6 percent sales tax to fuel purchases. The proposal is “big, bold, and it solves the problem,” former state Senate Majority Leader Ken Sikkema told reporters. Conservatives are opposed to Whitmer’s proposal. Tony Daunt, executive director of the conservative Michigan Freedom Fund, for one, told reporters that the proposed fuel tax hike is a “terrible idea.” He also suggested his group would fight tooth and nail any attempt to foist higher taxes on motorists. 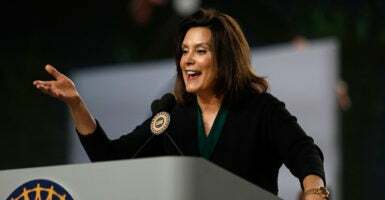 Whitmer’s idea comes almost two years after former Democratic California Gov. Jerry Brown signed a law in 2017 imposing a 12 cents-a-gallon increase on citizens and raising the tax on diesel fuel by 20 cents a gallon. It also implemented an additional charge to annual vehicle license fees ranging from $25 to $175 depending on the car’s value. California ranks seventh-highest in the country when it comes to total taxes and fees, according to figures calculated by the American Petroleum Institute. The recent increase makes California’s the second-highest gas tax in the country behind Pennsylvania. The Golden State’s gas tax would increase from 40 to 52 cpg. Michigan’s increase would bring the gas tax from the 26 cent-per-gallon gas tax to 71 cents per gallon, Kurt Weiss of the state budget office told UpNorthLive.